By beginning i mean approx. 8 years ago one of my closest friends talked me into going wheatpasting with him one night. (Wheatpasting is basically a form of street art where you paste paper images, drawings etc. to things like walls, signs or power boxes in public. ).....And so we did. Something happened to me that night something that has had one of the most impactful influences on my life. What i found out was that people who saw our stuff on the streets were confused, shocked, excited even mad sometimes, it was then that i realized art wasn't exactly what i had thought it was. i realized that art didn't have to be limited to museums or pretty walls of galleries, well to do's or artsy fartsy's but it could be in the grungiest dirtiest of places and be powerful....more powerful imo. Prior to this particular evening in 05 the only other artistic endeavor i recall was winning a coloring contest that the local paper put on of Hulk Hogan. i say this because art i as i "knew" it was about who could draw better who could stay within the lines better or who could make something look realistic. But this was different this was raw, expressive, loose and a bit risky, this was for everyday people not just the elite.... i was hooked. Shortly after my street art initiation i began painting on found pieces of wood and then i would hang them around town by nailing them to trees, telephone poles etc. basically anywhere the most amount of people would see them. Fast forward about 4 months of me and my friend doing this any chance we could get and i find out that a prominent restaurant owner had been taking down my paintings and was displaying them in her restaurant. One thing led to another and the next thing i knew i was having my first art show at the restaurant with my two buddies. That was over eight years ago and while it didn't happen overnight i can now say that art is my "career" and that stumbling upon this was nothing short of divine intervention, i'm blessed to say the least. Here is some words from my friend Jeremy (the one who sparked this whole thing) Thanks Remy! Around 8 years ago, Justin and I decided to try something neither of us had ever done before. We met at his apartment late one night. I brought some large sheets of paper (thrown out from a local blueprint printer), some markers, a bucket of wallpaper paste, a paint roller, and a plan. We drew some large drawings on the paper, hopped in Justin’s truck, and drove to the small downtown district of what I like to call our “Podunk” Florida town. Over the next few hours we pasted all our drawings around downtown, trying to secure the most visible spots for the public as possible. After a night of hiding in the dark, almost getting caught by the cops, and seeing our work displayed on the streets in daylight the next day… we were hooked. Over the following months we started to take it very serious. The town was plastered with our art. There wasn’t a power box that was safe from our mission. We even heard about a town hall-type radio show discussing our street art. What were they? Where did they come from? The town was baffled and pissed. We were just two kids, in our late 20’s, having fun, and trying to rekindle that youthful feeling of freedom. There was no goal or agenda. It was all about the thrill, the rush. There was one big difference between our works however. While I was painting more illustrative, Justin was on a different trip. His street art often begged a question, or offered a message. It’s an element of Justin’s art I have been both fascinated and inspired by for years. i'm often asked many questions about my work. One of the most common questions i hear is 'how long does it take you to make a painting? Now i know that this question is probably just an ice breaker or friendly banter but it got me thinking about my process. Let me go on record by saying that i'm not interested in making work that looks identical to something (the subject matter), but rather making work that makes you FEEL something. The truth is, i'm not a "trained" artist, i've never been to art school, let alone taken a class on color, i'm never going to impress you with my sweet brush skills or life like renditions of a beach or the human figure, while i can appreciate artists who possess those skills- the fact is, that's just not me. What i am after is capturing the thoughts and feelings of the human condition with images and words that make you stop and think about what's in front of you. i want to make honest work, raw work, vulnerable work, work that makes you happy, work that makes you cry, work that makes the common blue collar non artsy person say " i get that" or " you know i'm not really into art but i connect with what you do".... i want to make art that's approachable to everyday people. So with that being said, i've made paintings that have taken days and i've made paintings that have taken minutes. i've made paintings that have taken way too long all to paint over it in seconds because i didn't feel anything from it myself. In the end, i want to make work that sticks with you long after you've seen it regardless of if it took five minutes or five months to make. So as some may know I entered this years digital graffiti event in Alys beach, Fl. with my friend Shane Sauer of Thought Factory films. The event went great! Our loop "permanent impression" won the best in Florida award! Thanks to all who came out and showed support, looking forward to next years event already! Thank you all who came out for Artsquest, it was an awesome weekend despite the wet weather! The ''Heartsquest" painting auction ended at $3,300 and we were able to give half to the www.donations4danny.com Charity! extra thanks to and congrats to Mr. David Brasfield for his bid and contribution to the auction. 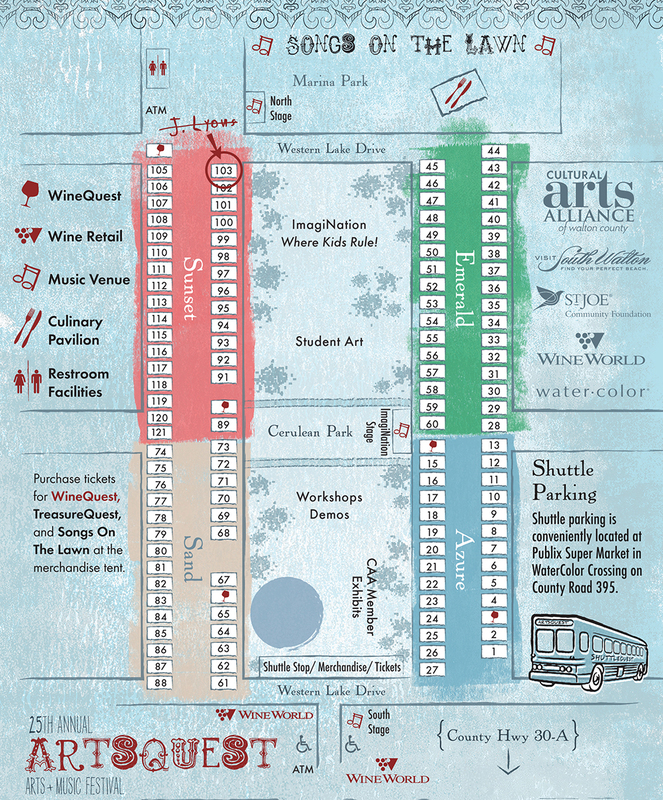 Knee-deep in last minute preparation for this weekend's Artsquest Fine Arts and Music Festival at WaterColor Inn & Resort ... be sure to visit us at booth #103!